In 2015 BIO-WEST began providing marine environmental support for a commercial terminal (wharf) creation and expansion project located in the Houston Ship Channel, Harris County, Texas. 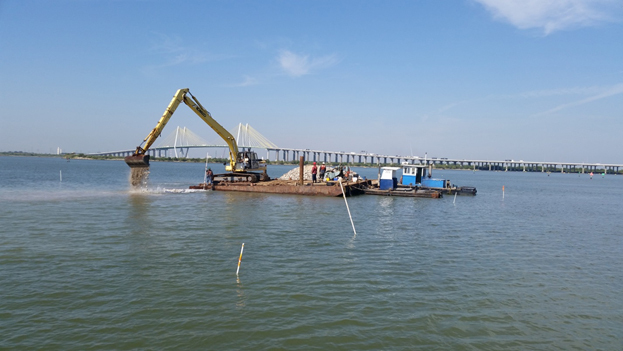 This project involves replacing an existing dock structure that requires hydraulic or mechanical dredging of a 12.6-acre area and removing an estimated 421,900 cubic yards of dredge material. 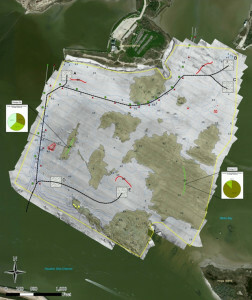 Within the footprint of the dredge area, 0.84 acre of oyster reef is anticipated to be impacted by project construction. 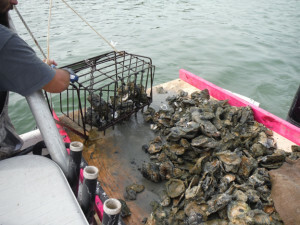 An environmental solution to relocate oysters, using a Texas Parks and Wildlife Aquatic Resource Relocation Plan, and construct a small artificial reef was identified and accepted by the US Army Corps of Engineers as a viable mitigation effort. BIO-WEST conducted preconstruction surveys in the project area to obtain current environmental resource information using a combination of remote sensing equipment and ground-truthing techniques. These efforts provided water depths, biological information, and substrate characteristics. The data were collected for the terminal footprint and the potential mitigation area. Port of Houston Authority lease agreements were initiated, and BIO-WEST is maintaining agency correspondence to ensure an efficient environmental permitting process. Agency coordination and communication with colleagues at the Texas Parks and Wildlife Department, US Fish and Wildlife Service, and the National Marine Fisheries Service have been paramount for the success of this project. Construction of an artificial reef was completed in October 2015 in a nearby bay. BIO-WEST provided construction monitoring and oyster relocation support. A structural assessment was conducted using side-scan sonar and bathymetry to ensure that construction had been completed. Additional structural and functional assessments will occur over a 5-year period, and side-scan sonar and dive teams will monitor the success of the oyster mitigation project.